(The Count. The story of Mogens Frijs). Gads Forlag in cooperation with The Danish Research Centre for Manorial Studies and Moesgaard Museum, 2017. ISBN: 978-87-12-05543-3. 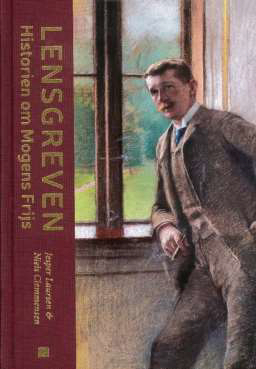 The Danish count Mogens Frijs (1849-1923) was the foremost representative of the noble upper class of his time. He was Denmark’s largest and richest estate owner who surrounded himself with the greatest possible pomp and splendor. The Frijsenborg country house in East Jutland was the center of Denmark’s largest collection of estates and for a social life that included a number of the country’s leading families and personalities, as well as numerous representatives from both the Danish and several foreign royal houses. At the same time, Mogens Frijs assumed the role of significant politician during a breakdown era in which real democracy was introduced in Denmark, and he contributed himself as the noble families lost their last privileges. This publication is based on an until now unknown private archive, and it draws an in-depth picture of the main character’s personal development and role in society. The book is richly illustrated with paintings and photographs, largely from the family’s outstanding collection.